The most effective solution for permanent progressive hair removal. 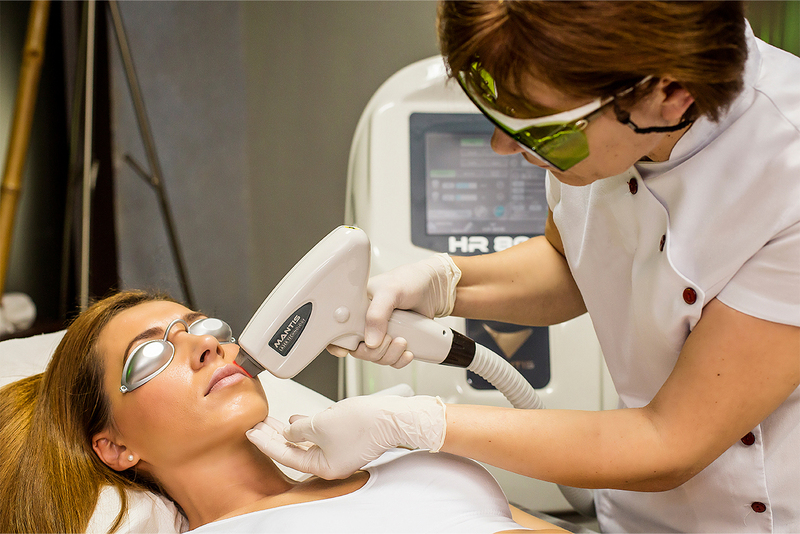 The HR 808 Laser Diode, your number-one ally in permanent hair removal, has a delicate action both on the face and body which does not damage the epidermis and tissue surrounding the follicle in any way. Selective photothermolysis heats up the hair follicle, and by destroying the germ cells permanently prevents regrowth. The laser light produced by the device - a unidirectional, consistent monochromatic light beam - is absorbed in a hyper-selective manner by the melanin present in the hair follicle. Treatment sessions are short, pleasant and painless. The results are clear to see right from the very first sessions. The thermal capacity of the laser light source is implemented via ACS - Active Cooling System - which offers virtually unlimited treatment times and raises the thermal capacity of the entire laser system. TMS - Thermal Management System - is the electronic- and software-based control system which measures the temperatures and flow levels of the liquids. 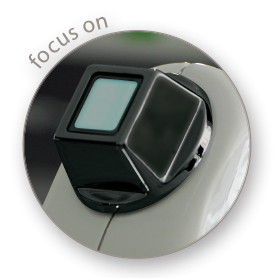 TMS allows the most common faults which occur in less advanced laser systems to be prevented. Why are ACS and TMS so important? The difference offered by these systems allow the product to provide incomparable results - which are still completely painless - thanks to constant cooling of the source and the crystal in contact with the skin. What's more, its short treatment sessions, long source lifetime and greater stability and energy output make the HR808 exceptional value as well as the top performer in its sector. The HR808 handpiece, designed to achieve maximum efficiency, has a real sapphire crystal head. The two active layers, one of which is mirror effect, prevent reflections to protect the source and improve both its lifetime and performance. 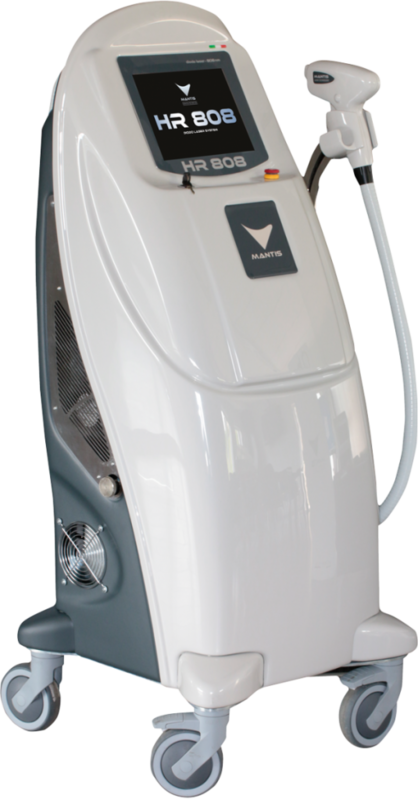 The laser energy penetrates the upper layers of the skin and transfers its energy to the hair. The energy is absorbed by the melanin present in the hair and converted to heat, which damages and ultimately destroys the hair follicle. 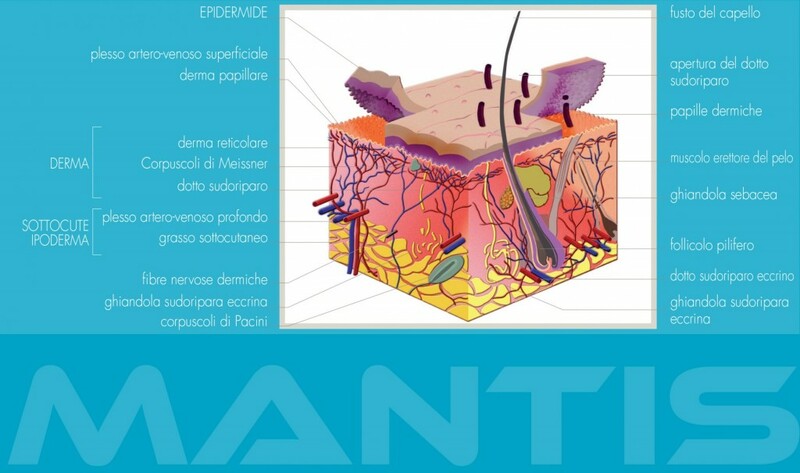 MANTIS HR 808 Laser Diode allows you to treat all skin phototypes at any time of year, without any contraindications. Our scientific research has allowed us to overcome the limitations of traditional light-source technologies, which did not allow dark (phototypes 5 or 6) or tanned skin to be treated in order to prevent the onset of unsightly spots. Scientific trials have shown excellent results in terms of hair removed from the treated areas. Tests performed in our laboratories have shown a complete lack of contraindications, both in the short and long term. 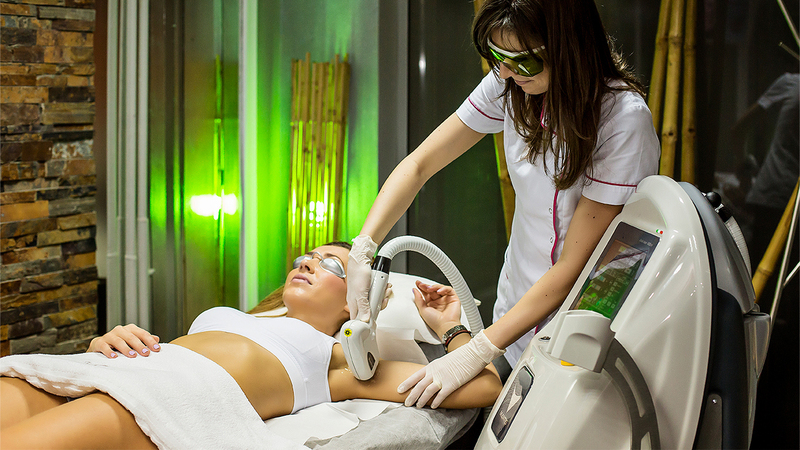 During treatment, patients will feel a slight sensation of heat when the laser is active on their skin. No pain has been reported. The product offers excellent performance thanks to the quality of its laser light source and treatment session protocols developed by experts. 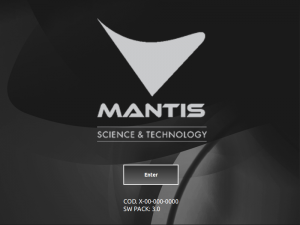 MANTIS HR 808 technology offers excellent results in a very short time. The effectiveness of our laser light source is guaranteed for up to 20 million shots. HR808 is very easy to use, as it is equipped with a touchscreen which displays the various operating modes of the machine, accompanied by explanations of the application protocols. Want more information, or to download our brochure?